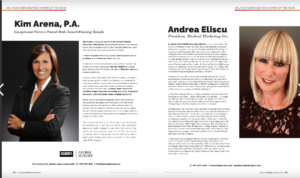 Orlando Style Magazine recently recognized Medical Marketing Inc. Founder and President Andrea Eliscu as one of its 2019 “Orlando Renaissance Women of the Year.” The honor recognizes professionals who exhibit excellence, integrity, client service and high standards that have made them preeminent and highly successful. Read the full profile here. Copyright ©2019, Medical Marketing Inc. All rights reserved.